Feldspar Lumps that we offer are formulated using Orthoclase, Albite and Anorthite. These lumps are used in ceramic industries as flux, in glass industries, acid proof refractories etc. Moreover, Feldspar Lumps are used as mild abrasive in scouring powder and as a flux in welding electrode industries. 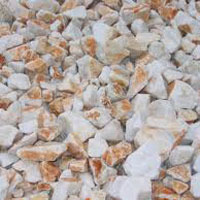 We are one of the prominent Manufacturers and Suppliers of Feldspar Lumps. One can obtain these lumps from us at the most reasonable prices.